10 dietician approved cold brew coffees! 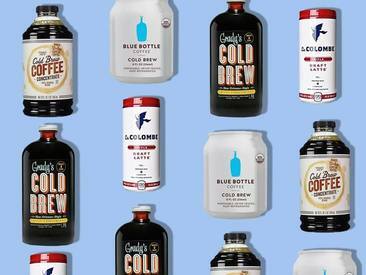 There are so many iced coffees on the market now that it's not always clear which ones are worth grabbing. Lindsey Pine, M.S., R.D., owner of Tasty Balance Nutrition, tells SELF that sweetenedsweetened iced coffees usually contain more sugar than you might add yourself, so you're better off sticking with unsweetened versions (and lightly sweetening them yourself, if you're so inclined). Amy Gorin, M.S., R.D.N., owner of Amy Gorin Nutrition, points out that bottled or canned iced coffees that contain milk can be a good choice, since milk adds a little protein while cutting bitterness. Additionally, she says that caffeine content is something to keep in mind. "You want to aim to keep your daily caffeine intake at no more than 400 milligrams a day," she explains, "and this can add up really quickly with cold brew coffee!" An 8-ounce cup of coffee usually has about 95 milligrams of caffeine, but a lot of cold brews are sold in a concentrated form that needs to be diluted with water. Make sure you're reading labels and not accidentally taking in way more caffeine than you think.